please choose the right size from our size chart ,due to manual measurement please allow 1-3cm error,thanks. suitable for: women ,ladies package: one dress If you have any needs, please contact us. If satisfied, please give us a five-star evaluation, thank you. 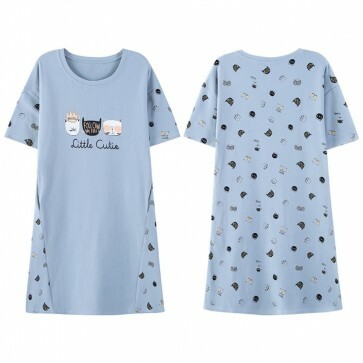 Our knee-length t-shirt style gown features a fun design of 3 cat faces, a white one with a crown, a black one with the message follow my feet? and another white one wearing rose-colored glasses! So cute! The asymmetrical cut of the sleepshirt features two panels, a sold light blue and another baby blue with an all-over print of fun cat faces! Made from 100% soft and luxurious cotton, it is a medium weight shirt that breathes so you will be comfortable through the night. Machine washable. Liven up your loungewear with a precious kitten pattern! 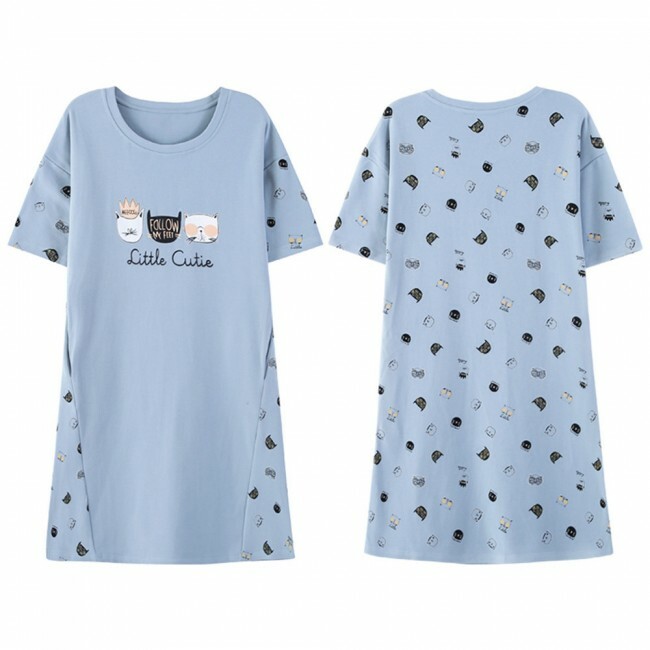 The soft blue color with a print of cats faces will give you the perfect reason to lounge around all day in your nightie! Nuestra camisola hasta la rodilla estilo camiseta cuenta con un divertido diseño de 3 caras de gato, una blanca con corona, una negra con el mensaje "Follow my feet" y otra blanca con gafas de color rosa! ¡Es tan mono...! El corte asimétrico del camisón de algodón para mujer presenta dos paneles, uno es azul claro liso y el otro es azul claro con un estampado de divertidas caras de gato. Confeccionada en algodón 100% suave y lujoso, es una camisa de dormir de peso mediano transpirable para que te sientas cómoda durante la noche. Lavable a máquina.